Saturday Night Fever is more than just an American dance film (as in disco dancing). It's an intense drama, a restless character study, and overall, a movie of its time. Yes, it's obviously a little outdated and John Badham's direction is somewhat sporadic (some of the sequences veer into a sort of broken narrative). However, there is an urgency and accuracy in the culture this exercise depicts. Last but not least, you have John Travolta in a performance that in 1977, shot him into the stratosphere of acting prowess. Yes, he was excellent later on in Pulp Fiction, but in "Fever" his star shines as bright as anyone in the Hollywood galaxy. Its been over 35 years since the film's release and Travolta has not come close to the brooding, anxious brilliance (he probably can dance just as good now, who knows) that he displayed as Tony Manero ("the king" or as one character notes, "the best"). 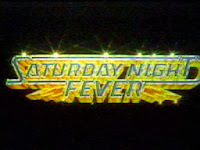 Not necessarily plot driven as it is more driven by ideas and characters; Saturday Fight Fever's concept is loosely based on a small article in New York Magazine (circa 1976). The article by Nik Cohn, is entitled "Tribal Rights of the new Saturday night." As far as storytelling goes, "Fever" takes the bare bones of Cohn writings and walks you through the trials and tribulations of some Brooklyn 20-somethings which are on full display throughout the 2 hour-plus running time. Their leader, Tony Manero, looks forward to his weekends where he can strut his stuff on the dance floor to the powerful and seducing music brought to you by The Bee Gees. Throughout the proceedings, he is caught in a tensioned love triangle (actresses Karen Lynn Gorney and Donna Pescow are two dancers he gets involved with and they are excellent in their roles as well), hangs with his buddies (he refers to them as "the faces") at the Brooklyn club 2001 A Space Odyssey (I'm serious), and feuds with his misunderstood parents who don't really know him as a person. As many critics note (this critic as well), the central theme of Saturday Night Fever is bent on looking into Manero's rough and irrelevant existence made only tolerable by snippets of glory here and there on the dance floor (and at a dance contest). I think what made the sequel (Staying Alive) such a mess (it was entertaining though, go figure), was how it failed to effectively put this aspect into motion. Sly Stallone directed Staying Alive and I think he missed the boat on Badham's initial touch with atmosphere and grittiness. Plus, it works better when Travolta's character stays away from doing shows on Broadway. Something also to note on "Fever": On the heels of what was written in the aforementioned article, production started in early 1977. Badham wasn't initially the director mind you. The original man behind the camera was John Avildsen (he directed Rocky). According to a documentary on the anniversary DVD, he was fired early on due to his initial vision of having Travolta's title role being portrayed as a quote unquote, "a nice guy who does good things for people in the neighborhood." The studios (along with the star's input I'm certain) wanted a harder edge to Manero's persona and I believe this is what makes this flick work (don't expect something like Grease or his kooky, lovable tough guy from Welcome Back Kotter). You like Manero even though he is remarkably unlikable. This is due to Travolta's high level of charisma and ability to cater to the mental and highly physical demands of the role. In fact, most of Travolta's cronies in the film (unknown actors at the time but very natural on screen) also kind of exhibit this quality. And as in many great feats of cinema (including this one), they stay with you long after the closing credits appear. To wraps things up, the aspect about "Fever" that makes it one of the best films of the 70's, is its realism. The characters don't sugarcoat their actions. There is a cynical nature about all of them (especially Manero). Granted, this is not a cheerful dance production number where everyone has a good time at the club and then goes home to a happy life. These people (Tony's family, friends, and even himself) have problems and a hollowing need to break away from their banal existence. Saturday Night Fever, focusing mainly on Travolta's plight, can be categorized as a snapshot of a young man's pride in his craft (shining at the discotheque) and the sad/troubling moments in between. It's raw, reckless film making that dares you to embrace its rough edges. Truth be told, you come away from this film with memorable sounds, bright images, and unavoidable mental train wrecks. The look of its poster with Travolta and Gorney holding hands in the middle of the dance floor, doesn't quite tell the whole story. You know there is more to "Fever" than just disco dancing. At the end of a scene taking place on the Verranzano-Narrows Bridge (connects Brooklyn to Staten Island), Travolta (Manero) says, "can you dig it, I knew that you could." Yeah it’s safe to say, that I can ultimately dig this landmark film.